Thai Hoxton uses their own specialised couriers to deliver their food. Carrot, beansprout, cucumber and lettuce. Wrapped in rice paper and served with sweet chilli sauce. Carrot, cabbage, vermicelli noodle wrapped in pastry. Deep fried and served with sweet chilli sauce. Minced chicken, carrot, cabbage, vermicelli noodle wrapped in pastry. Deep fried and served with sweet chilli sauce. Marinated king prawns wrapped in pastry. Deep fried and served with sweet chilli sauce. Mixed vegetables wrapped in puff pastry. Deep fried and served with cucumber sauce. Minced chicken and mixed vegetable wrapped in puff pastry. Deep fried and served with cucumber sauce. Minced chicken cooked with water chestnuts, peanut, corn, seafood stick wrapped in pastry and served with cucumber sauce. Marinated chicken breast fillets with Thai herb and served with satay sauce. Marinated chicken wings. Deep fried and served with sweet chilli sauce. Crispy chicken wings, deboned and filled with chicken mince and mixed vegetables. Served with sweet chilli sauce. Minced pork cooked with cabbage and water chestnuts. Served with sweet soy sauce. Traditional Thai fish cake served with cucumber sauce. Steamed dumpling served with soy sauce. King prawns coated with a light batter and tossed in coconut flakes. Deep fried and served with mayonnaise sauce. Crispy calamari topped with dried onion, coriander and served with sweet chilli sauce. Combination of each, Spring Roll, Curry Puff, Money Bag, Chicken Satay and Fish Cake. Served with sweet chilli sauce. 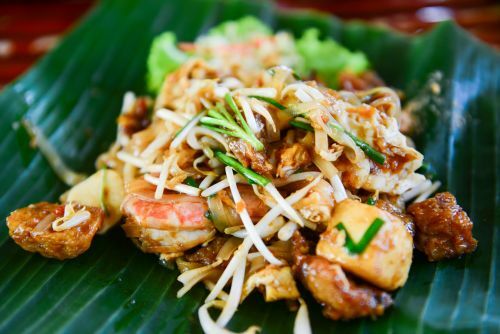 Stir-fry combination of seafood or prawns, mixed vegetables and Thai herbs. Curry with coconut milk, Thai herbs and mixed vegetables. Stir-fry combination of seafood, mixed vegetables and Thai herbs. Stir-fry combination of seafood with a touch of coconut cream and yellow curry. Deep fried soft shell crab tossed with coriander and fried onion served with sweet chilli sauce. Grilled salmon with mixed vegetable in oyster sauce or curry sauce. Deep fried whole barramundi with special mixed salad. Whole barramundi deep fried topped with chilli basil sauce. All "curry" dishes with you selection of the following vegetable, tofu, chicken, pork, beef, lamb, roast duck, king prawns or seafood. Traditional Thai red curry with red chilli paste and with mixed vegetables in coconut milk. Hotter green curry paste, coconut milk and with mixed vegetables. Milder and slightly sweet curry in coconut milk and with mixed vegetables. Mildest curry, coconut milk and with mixed vegetables. Mild Thai curry with potato, topped with fried onion and crushed peanuts. Marinated chicken thighs topped with fried onion and coriander, served with sweet chilli sauce. Marinated sliced beef topped with fried onion and coriander, served with sweet chilli sauce. Marinated baby octopus topped with fried onion and coriander, served with sweet chilli sauce. All "stir fry" dishes with you selection of the following vegetable, tofu, chicken, pork, beef, lamb, roast duck, king prawns or seafood. Crunchy cashew nuts tossed with mixed vegetables. Mixed vegetables with chilli jam sauce and cashew nuts. Mixed vegetables stir-fried in oyster sauce. Mixed vegetables stir-fried in satay sauce. Garlic and ground pepper stir-fried in mixed vegetables. Homemade chilli sauce, basil leaves and mixed vegetables. Classic Thai style sweet and sour sauce with pineapple, cucumber, tomatoes and mixed vegetables. Mixed vegetables stir-fried in chilli garlic sauce. Mixed vegetables stir-fried in fresh ginger. Mixed vegetables stir-fried in snow peas. Mixed vegetables stir-fried in spicy green peppercorn. Mixed vegetables stir-fried in red curry paste. All "noodle and rice" dishes with you selection of the following vegetable, tofu, chicken, pork, beef, lamb, roast duck, king prawns or seafood. Thin rice noodle stir-fried with egg, mixed vegetables and topped with peanuts. Flat rice noodle stir-fried with egg and mixed vegetables. Flat rice noodle stir-fried with egg, chilli basil and mixed vegetables. Flat rice noodle stir-fried with egg, chilli sauce, garlic, tomato sauce and mixed vegetables. Flat rice noodle and mixed vegetables stir-fried with peanut sauce. Hokkien noodle stir-fried with mixed vegetables and oyster sauce. Coconut milk based soup with thin egg noodle and mixed vegetables. Stir-fried jasmine rice with egg and mixed vegetables in oyster sauce. Mixed vegetables stir-fried with jasmine rice, egg and chilli basil. Jasmine rice stir-fried in tom yum pasted with egg and mixed vegetables. Green papaya with Thai herbs. Sliced beef with purple onion, chilli jam, lemon juice, coriander, shallots and mint. Sliced and grilled BBQ rump steak mixed with grounded rice, coriander, chilli powder, purple onion, lemon juice and mint. Minced beef or chicken with Thai herbs, chilli powder, mint, coriander and lemon juice. Boneless, roast duck with purple onion, mint, coriander, shallots, tomato, cucumber and lemon juice. Prawn or seafood mixed with purple onion, mint, coriander, shallots, tomato, cucumber, lemon juice and homemade sauce. Famous Thai spicy soup cooked with Thai herbs and mushroom topped with coriander. Traditional coconut milk soup flavour with Thai herbs and mushroom. Clear, spicy and sour soup infused with ginger and basil leaves.